Local honey… fresh flowers… seasonal herbs… there’s nothing better than a trip to the Farmer’s Market in the Spring! Until your little guy picks up a radish and pretends it’s a machete while you’re scrambling to rearrange the barrel of melons your toddler managed to empty in four seconds. Later, as you drool over the perfectly ripe “3 for $5” avocados, you spot your partner help themselves to their tenth strawberry; you’re both mortified and jealous because those samples looked so BERRY good. We’d love to see what hilarious shenanigans your babiekin gets into (and, of course, what they’re wearing!) on your next trip to the Farmer’s Market! Tina Burgos, the chief curator and founder behind Covet + Lou, has been emerged in the world of fashion since she was a small girl. Her unique and classic style is a quick reflection of the pieces and labels that she carries in her online boutique that is based out of Boston. We had the chance to sit down and chat with her about the history of Covet + Lou, her personal style and the trends for SS15. Make sure to pop on over to her store to see the well-curated gallery of womenswear, children’s attire, home goods and more. What sparked your interest to become involved in fashion and open your Boston-based online boutique? I’ve always been interested in fashion. My mom (after whom I named the shop) has an unbelievable sense of style, and that has really resonated with me throughout my life. She never follows trends; just concentrates on what she likes. My first job out of college was in the fashion industry, and it really just stuck with me. Ultimately, I (along with my husband and our good friend) opened a small boutique in the heart of Boston. We featured burgeoning talent and independent designers. After nearly a decade in business, we decided to close the shop. My twins were infants at the time and my work/life balance was off kilter. It was important to me to focus on the girls. Two years later, Covet + Lou came to be. With the website, I am continuing my original vision of highlighting up-and-comers and curating brands that are not readily available in the market. Additionally, I have rounded out the ready-to-wear with home goods and childrens apparel and accessories. I also stock a selection of vintage items, which I find at thrift stores and flea markets all over the country. What are some of the important factors to keep in mind when piecing together your inventory for a new season? It is important for me to constantly keep in mind that Covet + Lou is not meant to be everything for everyone. I carefully curate every single piece on the site, so each item reflect’s the Covet + Lou aesthetic. I scout out designers who have a distinctive point of view so the selection doesn’t feel commonplace. And I try to be sensitive to price, offering an entry point to the high end market. Honestly, I find inspiration in so many different places: the subway cars of New York, under-the-radar menswear blogs, interior design magazines just to name a few. My eyes are always open to how people execute their vision when it comes to design. And to me, the more effortless looking the better. I am a tomboy at heart. This is something I have known about myself since I was in grade school, and I have stayed true to it three decades later. I don’t like fussy and uncomfortable clothing. But uncomplicated does not necessarily mean boring. I like to incorporate several genres into my wardrobe: Japanese menswear, British street, and American Heritage seem to dominate my wardrobe selections. 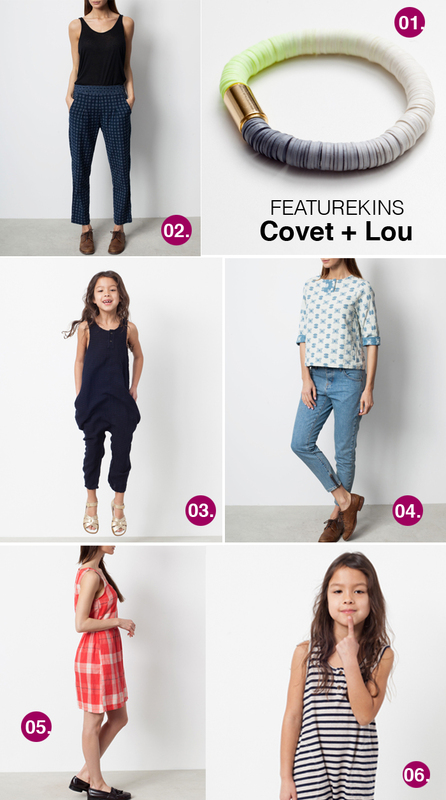 How would you describe the Covet + Lou customer? My clients are amazing! In a relatively short amount of time, I’ve been able to cultivate a very supportive community. My clients are also very savvy. They know what they like and what design elements compliment their lifestyles. What’s most exciting is that my clients are independent thinkers. They don’t follow cookie cutter trends, but rather are unique in their style choices. What are your favorite trends for SS15? The strongest trend is the mash-up of prints and patterns. This really should be categorized as a style element because this technique has stood the test of time. And you can be as subtle or bold when mixing textiles so anyone can incorporate this into their apparel and home decor. I also like the continued use of denim in innovative ways. It’s not just about the jeans any more; menswear shirting, lightweight jackets, deconstructed dresses are all something to look forward to this spring. And we’ll see this continue into fall with indigo and denim colored fabrics. Any future plans for the company? I am taking this journey one day at a time. It’s important for me to maintain a quality of life to spend time with my family, so the beauty of running this business from home is that I have the flexibility to give the twins my attention. If and when my time is compromised, I’ll have to make adjustments to maintain the work/life balance. I also think it’s crucial to expand the company in an intelligent way. As I am primarily responsible for every aspect of the organization, I need to scale in a manner that makes sense for healthy, sustainable growth. What’s one piece of fashion advice you can share with our readers? Trust your instincts! If you feel good and confident about your style, it will definitely show. Go away, winter. We’re ready to fiesta with Spring!